Absorption, utilization and assimilation of inorganic compound or minerals by plants for synthesis of essential material for their growth, development, structure and physiology is called Mineral Nutrition. The inorganic materials obtained from soil which are used as raw material by plants is called Mineral Nutrients. In other words, all living organisms have common basic needs as all of them need macromolecules i.e. Fats, Proteins, Carbohydrates, Water and Minerals for proper growth and development. The supply and absorption of specific chemical compounds needed for normal growth and metabolism of plants is defined as Nutrition. The chemical compounds that functions as raw material for synthesis of different structural and functional substance of plants are termed nutrients. With the rapid growth of population, it is important to adopt the reliable ways in order to meet the increasing need of food. 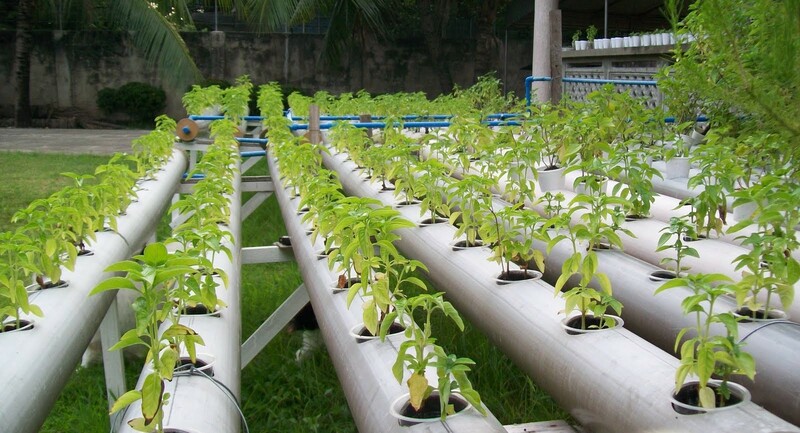 One such technique is referred as Hydroponics. It enables the plants to be grown anywhere. It helps in controlling the growth of plants. Nutrients and water are conserved in this process. 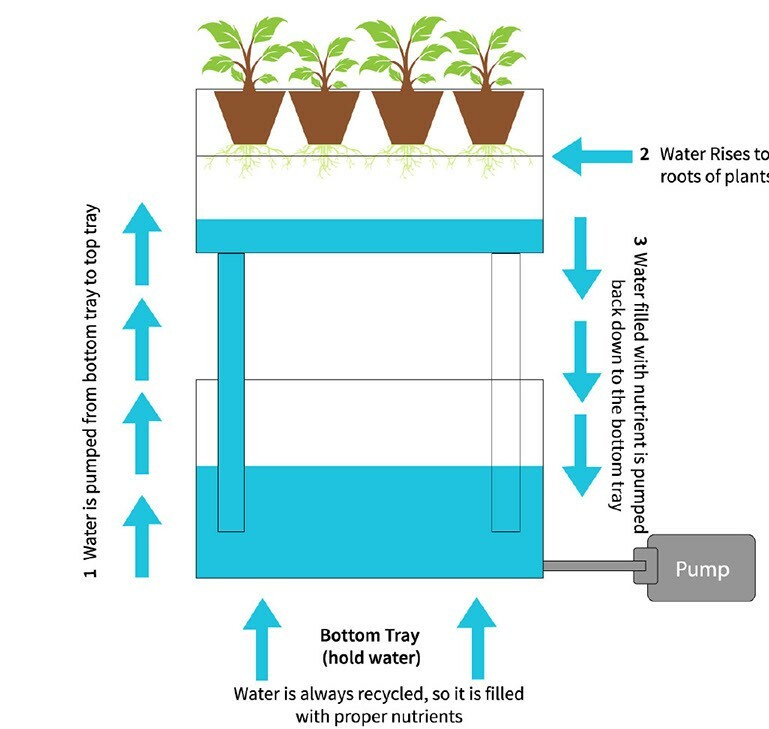 Following diagram demonstrates that entire process of hydroponics. In this process, water is recycled in order to fill the required nutrients. This process is a repetitive process and allows good growth to plants. The nutritional elements are present in the soil in ionic form and are absorbed via roots. Soil consists of more than 60 elements out of 105 elements discovered in different plants. These elements may occur in the soil in the form of some aqueous solution, or are adsorbed on inorganic and organic soil colloids, or in the form of insoluble inorganic compound or as a constituent of organic compound. An element must be absolutely important for the normal growth of plant and reproduction. In absence of those elements, plant will not be able to set seeds or complete their life cycle. The requirement of an element must be specific in nature. It implies that an element cannot be replaced by another. Thus, in case of deficiency of one element, supplying another element does not fulfill the requirement. The element must directly participate in metabolism. Macronutrients – These nutrients are present in large amount in the tissues of the plant. It includes Oxygen, Hydrogen, Nitrogen, Carbon, Phosphorus, Sulphur, Potassium, Magnesium and Calcium. Micronutrients – These are also called Trace Elements as these are required in very small amount. It includes Manganese, Iron, Zinc, Copper, Chloride, Nickel and Molybdenum. Essential elements are the components of biomolecules and structural elements of cell. It includes Hydrogen, Carbon, Oxygen and Nitrogen. Essential elements that are related with the component of energy, such as Magnesium in Chlorophyll and Phosphorus in ATP. Essential elements that activate or inhibit enzymes such as Carboxylase:Oxygenase and Phosphoenol Pyruvate Carboxylase. These enzymes are important in the fixation of photosynthetic carbon. Essential element with the capability to change the osmotic potential of cells. For Example: Potassium plays an integral role in opening and closing of stomata. Nitrogen – It is one of the very important nutrients required in greatest amount by the plants. It exists in soil in an organic form and is absorbed as No3- and some are taken as No2- or NH4+. Nitrogen is important for all parts of plants such as metabolically active cells and meristematic tissues. It is the major constituent of hormones, vitamins, nucleic acids and proteins. It increases the size of the leaves, promotes rapid growth along with fruit and seed development and hastens the maturity of the crop. In case of deficiency of nitrogen, plants show reduced growth, chlorosis, purples and red may intensify and reduced lateral breaks. Phosphorus – Phosphorus is absorbed by plants in the form of phosphate ions, i.e. HPO42- or H2PO4-. Phosphorus is one of the constituent of certain proteins, all nucleic acid, cell membranes and nucleotides. Phosphorous is required in phosphorylation reactions and is easily redistributed in several organs of plants. It activates coenzymes for the production of amino acid used in the synthesis of protein; and is important in metabolic processes as well. In case of deficiency of phosphorus, the plant show stunted growth, reddish purple tips and margins of leaves, dark green leaves with leathery texture and maturity is delayed. Potassium – Plenty of potassium is required in meristematic tissues, root tips, leaves and buds. It is absorbed as (K+) potassium ion and helps in maintaining anion – cation balance in leaves. Potassium is involved in opening and closing of stomata, protein synthesis, maintenance of turgidity of cells, facilitates cell division and growth and activation of enzymes. In case of deficiency of potassium, the plants remain smaller and shows brown margin on its leaves. Calcium – The calcium ions (Ca2+) are also absorbed from soil and are required by differentiating and meristematic tissues. Calcium improves the penetration of water and root via soil and helps in maintaining the stability of soil particles. During the cell division, calcium is used in the formation of wall of cells in the form of calcium pectate in middle lamella. Calcium is used and is involved in normal functioning of cell membranes during the formation of mitotic spindle. It regulates several metabolic activities and activates certain enzymes as well. In case of deficiency of calcium ions, the growth of the bud is inhibited, followed by cupping of mature leaves and weak growth. Magnesium – Magnesium is absorbed in the form of divalent Mg2+. It is responsible for activating the enzymes of photosynthesis, respiration and is involved in synthesis of nucleic acid (RNA and DNA). Magnesium is important constituent of ring structure of chlorophyll and helps in regulating metabolic activities. It also helps in the formation of fruits and nuts and in germination of seeds as well. Deficiency of magnesium results in extensive interveinal chlorosis that initiates with basal leaves and progresses to younger leaves. Sulphur – Sulphur is obtained by plants in the form of sulphate ion SO42-. It is present in two amino acids and is the main constituent of several coenzymes like methionine and cysteine. Sulphur is also taken by leaves in gaseous form SO2. 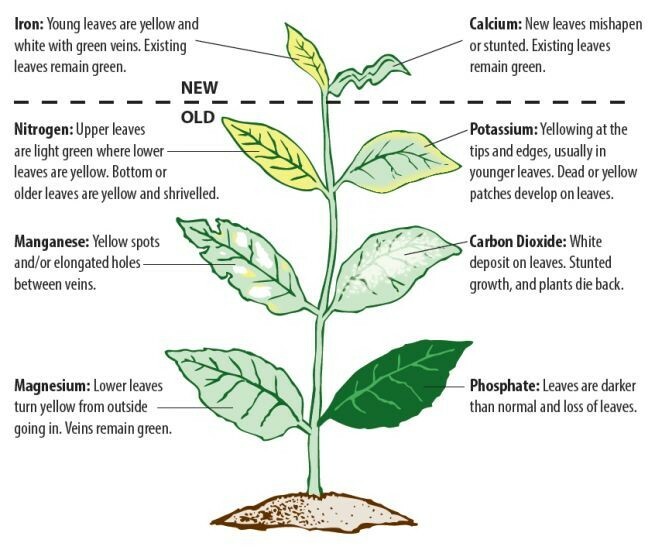 Deficiency of sulphur results in general chlorosis of leaves, including vascular bundles. Iron – Iron is obtained in the form of ferric ions (Fe3+) and plenty of ferric ions are required by plants as compared to other micronutrients. It is an important constituent of protein which is involved in transference of electrons such as cytochromes and ferredoxin. It is reversibly oxidized from Fe2+ to Fe3+ during the transfer of electron, activates catalase enzyme and is important for the formation of chlorophyll. Deficiency symptoms are larger amount of interveinal chlorosis, starting with younger leaves. Manganese – Manganese is absorbed in the form of manganous ions Mn2+ and helps in activating enzymes required in respiration, nitrogen metabolism and photosynthesis. Its main role is in splitting of water to release oxygen during the process of photosynthesis. The deficiency of this nutrient results in disorganization of chloroplast thylakoid membrane. Zinc – Zinc is obtained as Zn2+ ions and activates enzymes like carboxylase. Zinc is important in the synthesis of auxin and absence or deficiency of zinc results in interveinal chlorosis of upper leaves. Absence of zinc results in slowing down of shoot, resulting in rosette like appearance of plants. Copper – Copper is absorbed in the form of cupric ions (Cu2+) and is important for the overall metabolism of plant. Copper is associated with the enzymes involved in redox reactions as iron and is irreversibly oxidized from Cu+ to Cu2+. More than half of the copper is present in chloroplast and plays an integral role in photosynthesis. Absence of copper results in dieback of shoots. Boron – Boron is absorbed as BO33- or B4O72- and is required for uptake and utilization of Ca2+, pollen germination, functioning of membrane, cell differentiation, cell elongation and translocation of carbohydrate. In case of deficiency of Boron, terminal buds are damaged, resulting in rosette effect on leaves. Fruits, roots and tubers are discolored, cracked and  flecked with brown spots. Molybdenum – Molybdenum is obtained as molybdate ions (MoO22+). It is a component of various enzymes like nitrogenase and nitrogen reductase, enzymes which participate in the metabolism of nitrogen. Absence of molybdenum results in pale green leaves with cupped or rolled margins. Chlorine – Chlorine is absorbed in the form of chloride ions (Cl-) and adding with Na+ and K+ it helps in determining solute concentration and anion – cation balance in cells. Chlorine is important in water splitting reaction in photosynthesis and as a result of this; it leads the evolution of oxygen. Absence of chlorine results in reduced growth, interveinal chlorosis, reduced growth and nonsucculent tissue. Each nutrient has an important role to play and perform specific functional or structural function. In the absence of those nutrients, plants show several morphological changes. These changes are indicative of certain deficiencies of an element is called Deficiency Symptom. These Symptoms vary from plant to plant and disappear as soon as the deficiency is recovered. It is important to note that if the deficiencies occur continuously, it may result in death of the plant. The symptom of deficiency also depends on mobility of the element in plant. For instance, if the elements that are actively mobilized and exported to younger developed tissues, the deficiency symptom tends to appear first in older tissues. On the other hand, in case the element is immobile, the deficiency symptoms are visible in younger leaves at the initial stage. Following image shows the deficiency symptoms of different nutritional elements. For instance, deficiency of iron results in yellowing of leaves and white with green veins and deficiency of calcium results in stunted growth of new leaves, etc. Example of Deficiency – The Deficiency Symptom of Magnesium, Potassium and Nitrogen are visible in senescent leaves. The micronutrients are the nutrients that are required in very less amounts and therefore, even their little deficiency results in deficiency symptoms. On the other hand, even the moderate increase of nutrient causes toxicity. Thus, it can be said that plants have the optimum requirement of nutrition. The symptoms of toxicity are difficult to identify because level of toxicity varies from plants to plants. There are several cases where an excess of an element may prevent the uptake of another element. For instance, in case of toxicity of manganese, the plants show prominent symptom, i.e. appearance of brown spots all over chlorotic vein. It, on the other hand, inhibits translocation of calcium in the apex of shoots. Moreover, Manganese competes with magnesium and iron for uptake and with magnesium for binding with enzymes. Thus, the toxicity of manganese results in Deficiency Symptoms of Magnesium, Calcium and Iron. The studies for understanding the Mechanism of Absorption of Elements in plants are carried on isolated organs of it like tissues and cells. According to these studies, two main phases are included in the absorption of elements. In the initial phase, the passive uptake of ions takes place in outer space or free space of cells - Apoplast. In the latter phase of uptake, ions are slowly absorbed in inner space referred as the symplast of the cells. The passive movement of ions into the apoplast is carried out via ion – channels, the trans-membrane proteins that act as selective pores. Added to this, the entry and exit of ions to and from symplast need metabolic energy and thus, it is an active process. This movement of ions is referred as Flux, whereby inward movement into the cells is influx and vice versa, i.e. outward movement is Efflux. Following diagram shows the mechanism of absorption in plants. 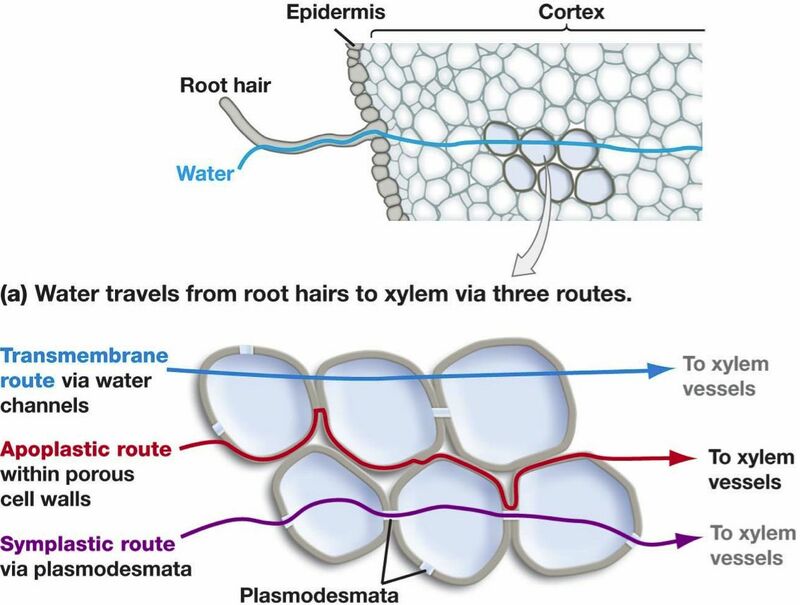 For instance, water travels with the help of root hairs to xylem via three routes, i.e. transmembrane route,  apoplastic route and symplastic route. In its absence, plant is not able to complete the life cycle normally. The element is a part of some essential plant metabolite or constituent. Q2. What are the hunger signs of plants? Sol. When the plant is not able to get sufficient amount of macro and micro nutrients, they portray poor growth and develop several deficiency symptoms. These symptoms are regarded as hunger signs of plants. Q3. Define the term Critical Concentration. Sol. There are several situations when the plant growth is retarded due to limited supply of essential nutrients. The concentration of the essential elements below which plant growth is retarded is termed as critical concentration. The element is said to be deficient when present below the critical concentration. Q4. What is the translocation in plants? Sol. “Translocation is the movement of materials from leaves to other tissues throughout the plants. Plants produce carbohydrates (sugars) in their leaves by photosynthesis but non photosynthetic part of the plant also requires carbohydrate and other organic and nonorganic material.” In this process, mineral salts are translocated via xylem, along with ascending water stream that is pulled up through the plant via transpirational pull. We can analyze the presence of mineral salts in xylem sap or use radioisotopes in order to get the evidence that they are transported via xylem. Sol. Plants have tendency to absorb different nutrients from the soil and the nutrient that does not play any role in metabolism and physiology of plants is regarded as inessential. For example, plants growing near radioactive sites collect radioactive metals but these are not required by them. Similarly, selenium and gold is also collected in plants near mining sites and these are also unwanted for the survival of plant. Q6. Explain the terms: macronutrients, micronutrients, beneficial nutrients, toxic elements and essential elements. Sol. Macronutrients are the nutrients required by the plants in large amount. They are present in tissues of plant in around 10 mole Kg-1 of dry matter, such as oxygen, nitrogen and hydrogen. Micronutrients are the trace elements present in the body of plant in very small amount, i.e. less than 10 mole Kg-1 of dry matter, such as manganese, zinc, cobalt, etc. Beneficial nutrients may not be essential nutrient, but are beneficial for the growth of plant, such as sodium, selenium, etc. Toxic elements are the elements that induce toxicity in plants, such as toxicity of manganese in large amount induces deficiencies of magnesium, calcium and iron by interfering in their metabolism. Essential elements are important for the growth and reproduction of plants. The requirement of these elements is specific and non-replaceable. 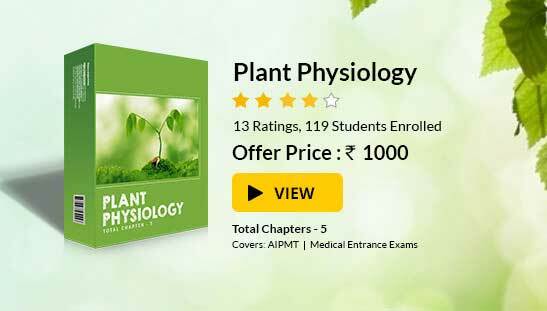 To read more, Buy study materials of Mineral Nutrition comprising study notes, revision notes, video lectures, previous year solved questions etc. Also browse for more study materials on Biology here.